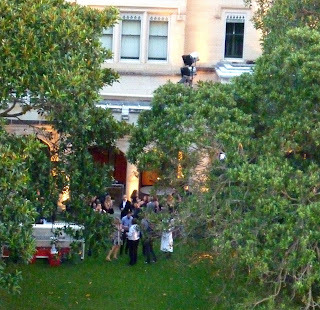 Kerry Jones' circle of friends is rapidly widening if the celebrations at her 57 room Darling Point mansion Swifts are anything to go by. Shuttlers may recall we have written before about the parties, antique fairs, conferences, product launches and charity fundraisers that have been happening at the rate of two a week at the 3.5 hectare property in the suburb. 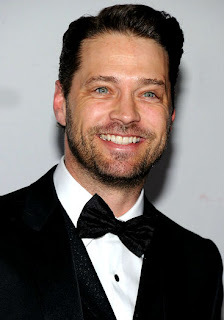 On Wednesday Fox International threw a roaring bash with former Beverley Hills 90210 star Jason Priestly as the guest of honour to celebrate the launch of his new series Call Me Fritz that airs on Fox's FX channel later this year. 150 guests rolled up to the house where they found roulette and backgammon tables, a supply of cigars from a humidifier, a whisky sampling bar and plenty of cocktails and champagne. The Shuttle's spy disguised as a Darling Point senior citizen reports the noise was deafening especially when Priestly took to the microphone and appeared to scream for a full five minutes at the top of his lungs. Kerry Jones has denied the parties are commercial events and says they are functions held for 'friends' including two wedding receptions last month. 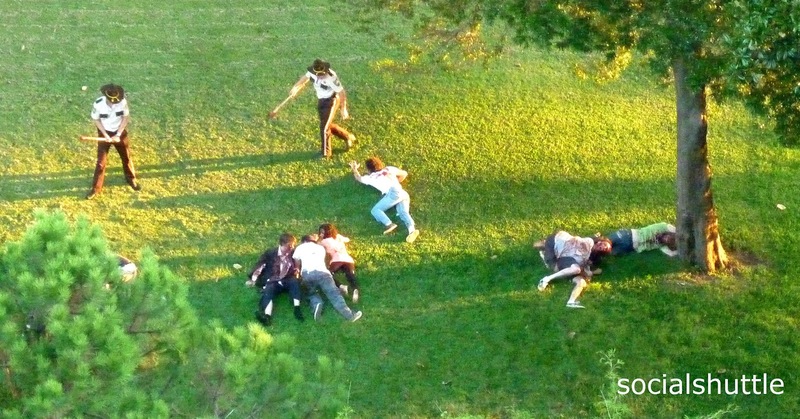 Even more disturbing was an odd event held last weekend and our spy dusted of her Box Brownie and supplied these snaps taken from her bedroom window on the 11th floor of a neighbouring block of apartments that overlooks Swifts gardens.
" I don't know what was going on " says our pensioner" but the guests appeared to be firing guns at each other and then police arrived to round them up and lay them handcuffed on the ground. I'm told it was some sort of game but the fake gunshots scared the hell out of my cat who disappeared into a wardrobe for 2 hours and the racket went on all day"
Kerry Jones, the daughter of nursing home tsar Doug Moran (both left) who lives at Swifts with her extended family has called the claims that the house is operating as a defacto reception centre as "mischievous" but that has enraged the already seething residents of the genteel suburb who in a flurry of letters to the local Wentworth Courier newspaper demanded Jones retract the statement. Another who wishes to remain anonymous but lives beside Swifts said " she must think we are stupid if she thinks we believe all these people attending parties are friends. I've counted over 2000 guests in the last 3 months". And indeed Mrs Jones has claimed the party for Jason Priestley and Fox International was a “private party” for her friend, Fox International Channels managing director Karin Simoncini. On Tuesday at the launch of the Australian Fashion Walk of Style in Oxford Street, the Shuttle button-holed a Woollahra councillor who refused to comment on the resident's claims but did say "it's all coming to a head". Now it seems the Jason Priestly party was the last straw and on Friday Woollahra Council's planning office said they would take legal action in the Land & Environment Court unless Kerry Jones gave a written undertaking that she would hold no further events at Swifts without council planning permission. Mrs Jones has responded angrily and said she is thinking of cancelling an upcoming charity fundraiser in March for the Cornucopia Committee.